The Federal Highway Administration (FHWA) plays a leadership role in shaping and executing a National Research and Technology (R&T) program. The agency also acts as a convener; collaborations with State, industry, and academic partners provide the foundation for conducting research and developing innovations that are essential, indispensable, and connected to the needs of transportation system users. FHWA's continuing commitment to highway research and the implementation of ground-breaking technology is changing the way roads, bridges, and other facilities are designed, built, and maintained across the country, ultimately improving the transportation system's safety, reliability, effectiveness, sustainability. This document highlights examples of valuable FHWA research, translated into applications of ground-breaking technology that improve the transportation system's performance - in safety, reliability, effectiveness, and sustainability. For transportation agencies faced with aging infrastructure and a backlog of roads and bridges in need of repair or major rehabilitation, even while costs have risen faster than budgets, enhancing system performance is key to continuing to provide the transportation system that the Nation depends on every day. FHWA's 21st century research is developing the technologies that will result in smarter, safer, and longer lasting pavements and structures, while reducing congestion and saving money. Many of these technologies have already moved from the laboratory to the highway, providing dramatic real-world benefits and changing the way transportation agencies do business. Building bridges better, faster, and for less money - In Ohio, the bridge of the future has arrived. Rather than demanding expensive new equipment or materials, these revolutionary new bridges can be built using readily available materials and common construction equipment, without the need for highly skilled workers. What's new is that the bridges use geosynthetic reinforced soil (GRS) technology for abutments. Instead of a conventional bridge abutment, GRS technology employs the low-tech approach of alternating layers of compacted local soil and sheets of geotextile fabric reinforcement to provide support for the bridge. The technology produces bridges that are extremely durable, while saving money at the same time. Compared to standard bridge construction, transportation agencies can cut their costs by 25 to 50 percent. Researchers at the U.S. Forest Service and the Colorado Department of Transportation (CDOT) pioneered the early development of the technology. FHWA then worked with CDOT to further refine it. FHWA has built and tested several full-scale GRS structures at its Turner-Fairbank Highway Research Center in McLean, Virginia. 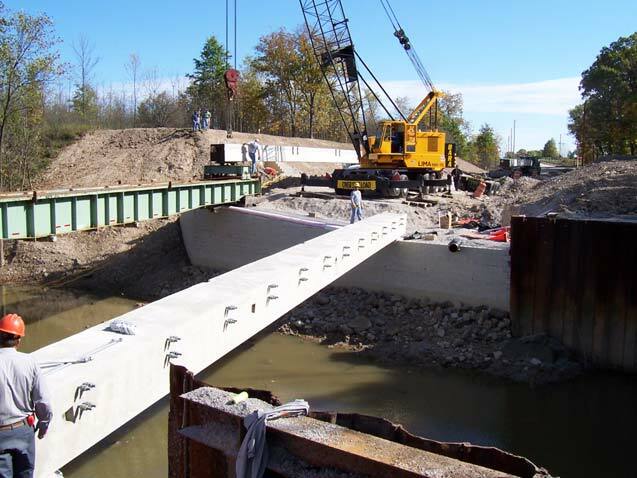 In 2005, FHWA provided guidance and abutment design plans to Defiance County, Ohio, to build the Bowman Road Bridge using GRS technology. This was the county's first time using the technology to build bridge abutments and the innovation quickly paid off. Defiance County realized a cost savings of nearly 25 percent and built the bridge in 6 weeks, shaving 2 weeks off the construction time for a conventional bridge. Since that initial project, 13 more bridges have been built in Defiance County using GRS, with similar successful results. Other Ohio counties and several States also are interested in using the technology. In summer 2008, Warren County, Ohio, built both a temporary bridge and a permanent bridge on GRS abutments. Morgan County, Ohio, meanwhile, has used GRS to replace a failed bridge abutment. As more State and local agencies learn about the tremendous potential that GRS offers to save time and money on bridge construction, FHWA's next step is to develop design and construction guidelines on using GRS technology for highways, with a primary focus on bridge abutment applications. On many American roadways, mobility has ground to a halt, eating up time, money, and economic productivity. According to the Texas Transportation Institute's 2007 Urban Mobility Report, "congestion caused urban Americans to travel 4.2 billion hours more and to purchase an extra 2.9 billion gallons of fuel for a congestion cost of $78 billion" in 2005. FHWA is identifying needs and developing and deploying innovations that have the potential to dramatically reduce traffic congestion. These innovations include new traffic control and highway design technologies. 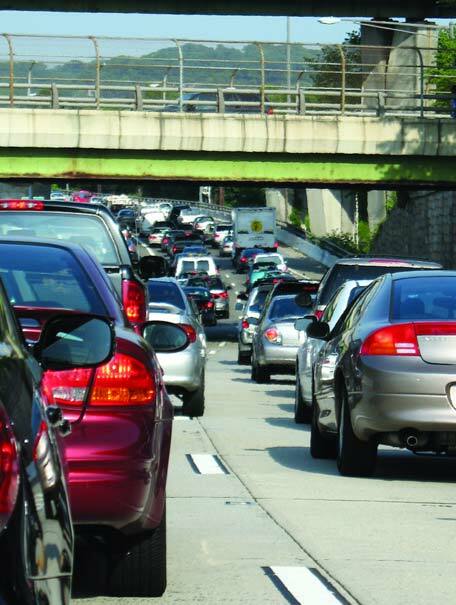 From highways to local roadways, congestion is a daily reality for many of the Nation's drivers. Reducing that congestion presents transportation departments with a complex challenge. Should they add more lanes? Change the traffic signal timing? Or restrict the use of certain lanes to high-occupancy vehicles? FHWA's Corridor Simulator (CORSIM) software, which grew out of simulation software first developed by the agency in the late 1970s, has been used by thousands of engineers and researchers worldwide to simulate traffic and traffic control systems, offering solutions to help reduce congestion and improve highway operations. The software simulates traffic and traffic control systems using commonly accepted vehicle and driver behavior models. The real-world benefits can be seen in towns such as Des Moines, Iowa, where a freeway diamond interchange built to accommodate only modest traffic flows was no longer working. Congestion was rising and drivers' patience was waning. Plans were being made to raze the existing interchange and construct a massive partial cloverleaf interchange capable of handling heavier traffic loads. 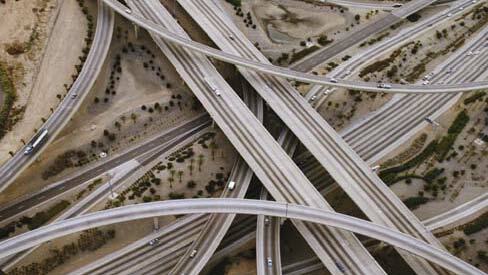 However, engineers first tested their existing interchange using CORSIM. The test indicated that the problem was due more to poorly timed adjacent traffic signals than a lack of roadway capacity. FHWA staff, working with the Iowa Department of Transportation, recommended modifications to the existing signal patterns, which both improved traffic and saved Iowa $14 million in right-of-way purchase costs alone. It is estimated that more than 300 million vehicle hours of traffic delay in metropolitan areas and on local roads are caused by outdated or poor traffic signal timing. ACS Lite, a reduced-scale version of FHWA's Adaptive Control Software (ACS), offers a low cost solution that operates in real time, adjusting signal timing to accommodate changing traffic patterns and ease traffic congestion. It is designed for closed loop traffic signal systems, which account for 90 percent of the traffic signal systems in the United States. The software can be used with new signals or to retrofit existing traffic signals. ACS Lite has been integrated with selected controllers manufactured by Eagle, Econolite, McCain, and Peek/Quixote. 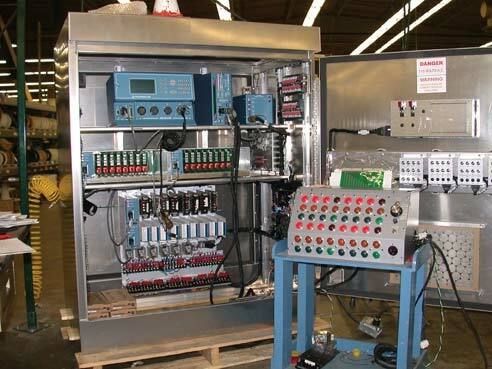 Four separate field tests were conducted with ACS Lite to validate the operation of each manufacturers' controller. Among the locations that tested ACS Lite is Manatee County, Florida. Results showed a 12 percent reduction in travel time and a 23 percent reduction in travel time delays. The average improvements observed on typical weekdays from all of the field tests included a 22 percent reduction in travel time, a 25 percent drop in the number of stops, and over 4,000 gallons of fuel savings per intersection annually. Testing in Florida and the other locations has also resulted in estimated annual roadway user cost savings ranging from $88,000 to $757,000. ACS Lite was developed by FHWA in partnership with Siemens, Purdue University, the University of Arizona, and ITT Industries. The ACS Lite system is now available through Eagle, Econolite, McCain, and Peek/Quixote. More than 40,000 fatalities and 3 million injuries occur on the Nation's roadways each year. With increased traffic and a growing U.S. population, reducing these statistics presents a difficult challenge for transportation agencies. FHWA researchers analyze roadway accidents from all angles. By looking at the driver, the vehicle, and the highway infrastructure, researchers can identify deficiencies that lead to accidents and develop measures to counter those deficiencies and create a safer roadway environment for all users. This multipronged approach includes examining accidents where vehicles leave the roadway, speed management, intersection safety, and pedestrian safety. Median cross-over crashes, where a vehicle crosses the median into opposing traffic lanes, can be deadly. The North Carolina Department of Transportation (NCDOT), for example, has found that fatalities are three times more likely in cross-median crashes than in other freeway crashes. NCDOT has been a pioneer in the use of cable median barriers in areas where there is sufficient median width and a high potential for cross-median crashes. Since 1998, the agency has installed hundreds of miles of cable median barriers across the State, instead of using the traditional concrete and metal beam barriers. NCDOT estimates that between 1999 and 2005 more than 95 cross-median crashes were prevented, saving more than 145 lives. and to demonstrate the implications of varying maintenance strategies. As satisfying as that improvement was, North Carolina wanted to do even better. NCDOT worked with FHWA to analyze cable barrier performance and look for improvements. The research team applied advanced digital simulation techniques to analyze the dynamics of vehicles as they cross a median and determined that a barrier's performance depends on where it is in the median. A barrier that is quite effective at one position within the median width may be less effective in another location. Conversely, a barrier with apparent shortcomings may perform well if it is shifted towards one side or the other. These findings were confirmed in a series of full-scale crash tests at FHWA's Federal Outdoor Impact Laboratory. This research has now been expanded to cover different barriers and a range of median configurations. The results are being used to develop new cable barrier standards in several States. They are also being translated into guidelines for incorporation into the American Association of State Highway and Transportation Officials' Roadside Design Guide. In 2007 nearly 2.4 million intersection-related crashes occurred, accounting for 40 percent of all crashes in the United States and 22 percent of all traffic fatalities. Estimated economic losses from intersection crashes amounted to $92 billion. Improving intersection safety is one of FHWA's top priorities. FHWA has been at the forefront of research into the design and application of roundabouts, which are one-way, circular intersections where traffic flows around a center island. The results from roundabouts in use are dramatic. A report published by the National Cooperative Highway Research Program in 2007 found that the installation of roundabouts led to a 35 percent reduction in total crashes and a 76 percent reduction in crashes causing injuries or fatalities. Numerous other studies have reported similarly impressive safety benefits from roundabout use. 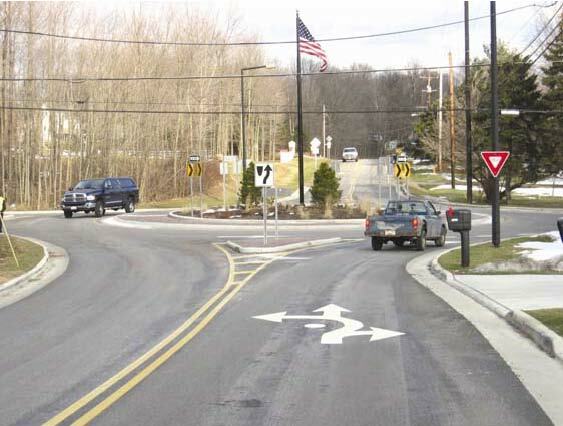 In light of these safety benefits, FHWA has designated roundabouts as a priority technology. To support the implementation of roundabouts, FHWA offers a comprehensive guide, Roundabouts: An Informational Guide. The Safety and Design Technical Service Team at the FHWA Resource Center also offers a 1-day workshop on roundabout safety and design, a video entitled "A Case for Roundabouts," and an informative brochure to help agencies implement roundabouts in their jurisdictions. In recent years, FHWA researchers have evaluated alternative intersection designs that offer to improve intersection safety while meeting the challenges of increasing capacity, decreasing congestion, and minimizing the cost of new infrastructure. 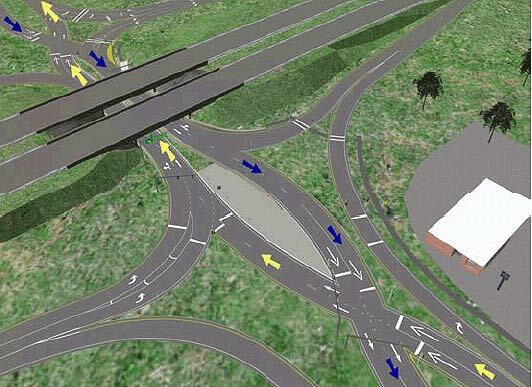 Among these alternative designs is the diverging diamond interchange (DDI). Using the DDI, arterial traffic approaching the interchange crosses over to the left side of the arterial roadway. Vehicles can then turn left onto limited-access ramps entering a highway without having to stop and without conflicting with through traffic. Eliminating crossing conflicts between vehicles turning left onto the highway and opposing arterial traffic offers potential safety benefits. Overview graphic of the diverging diamond interchange (DDI). The design also offers operational and cost benefits. The Missouri Department of Transportation estimates that a proposed DDI in Kansas City would cost half as much as retrofitting a conventional diamond interchange. Traffic modeling also suggests that upon completion the proposed DDI would be operating at only 60 percent of its traffic capacity, while the conventional diamond interchange option would be operating at 95 percent of capacity. FHWA researchers are monitoring plans to construct DDIs in Kansas City and other locations so that their actual safety and operational performance can be documented. With transportation sources accounting for nearly 30 percent of carbon dioxide emissions in the United States, reducing emissions and minimizing the impact of highway infrastructure on the environment is a significant focus of FHWA's research and technology activities. FHWA is a primary sponsor of the U.S. Department of Transportation's Center for Climate Change and Environmental Forecasting. Through strategic research, policy analysis, partnerships, and outreach, the Center develops comprehensive and multimodal approaches to reduce transportation-related emissions. FHWA is working to improve construction techniques and reduce the impact of highway infrastructure on the environment, including efforts to accelerate construction and reduce congestion and related emissions, reduce the runoff from highways, prevent the introduction of harmful elements or byproducts into the environment, increase the reuse and recycling of infrastructure, and reduce the energy required for highway construction. Additional research is examining the potential to reduce energy use, emissions, and costs through using innovative intelligent transportation system technologies, improved regional transit services, and new bicycle and pedestrian options. FHWA's Center for Environmental Excellence offers the resources that State and local agencies need to deliver environmentally sound transportation projects, programs, and services. Established by the Safe, Accountable, Flexible, Efficient Transportation Equity Act: A Legacy for Users in 2005, the center is run by the American Association of State Highway and Transportation Officials under FHWA's sponsorship. It provides a one-stop shop for transportation professionals seeking technical assistance, training, information exchange, partnership-building opportunities, and quick and easy access to environmental tools. Through the center, FHWA can leverage its research into environmental sustainability, promoting best practices, tools, and other innovative techniques and providing expert knowledge. The center has produced 10 Practitioner Guides that provide practical advice on current environmental management issues in an easy to read format. The widely distributed guides cover such topics as Tracking Compliance with Environmental Commitments and Defining the Purpose and Need and Determining the Range of Alternatives for Transportation Projects. "I use all of the center handbooks by sharing them with my staff, our districts, consultants, and even our local partners," says Tim Hill, Administrator of the Ohio Department of Transportation's Office of Environmental Services. "I have found the handbooks to be an excellent tool to communicate specific planning and environmental issues. At times, our audiences grow tired of hearing the rules and requirements from the same perspective. The center handbooks offer a fresh and new perspective to the requirements and have greatly reinforced the process and procedures that my office has been training on for years." Additional center activities include hosting a popular Webcast on Integrating Transportation Planning and National Environmental Policy Act Decision-Making. Also offered as a Podcast, the Webcast highlighted how addressing environmental issues early on, during the transportation systems and corridor planning process, can produce projects that more effectively protect and enhance the environment while providing needed transportation options. Nearly 900 individuals registered for the Webcast, with some locations hosting multiple viewers. 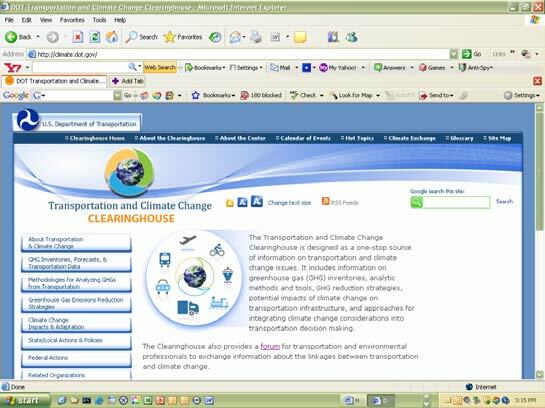 FHWA also supports the activities of the Transportation and Climate Change Clearinghouse (climate.dot.gov). Established with joint funding from the American Association of State Highway and Transportation Officials and the U.S. Department of Transportation, the Clearinghouse was launched in January 2009. It offers a central source of information on transportation and climate change issues for Federal, State, and local agencies and other stakeholders, providing a forum to share resources, learn about new research, and better understand new practices and approaches for reducing transportation-related emissions. Identifying and meeting the common goals of multiple stakeholders is key to developing and implementing successful transportation projects. 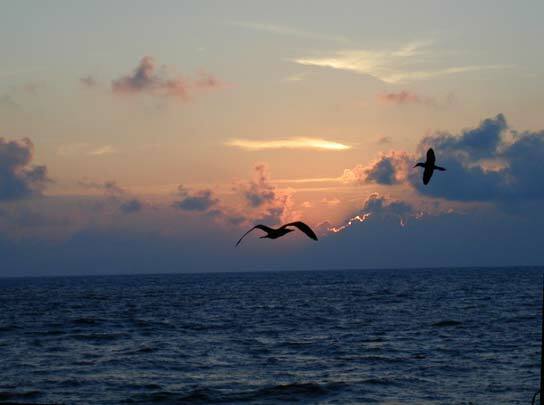 Efforts to minimize and mitigate stakeholder concerns, however, may not always provide the greatest environmental benefit or promote ecosystem sustainability. A new approach is advocated in Eco-Logical: An Ecosystem Approach to Developing Infrastructure Projects. 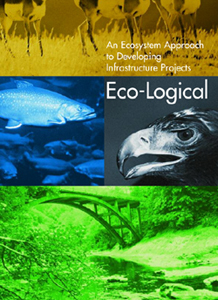 Developed by a U.S. Department of Transportation interagency steering team with input from four State departments of transportation, the 2006 guide describes how infrastructure development and ecosystem conservation can be integrated to more effectively meet economic, environmental, and social needs and objectives. The guide's resources include sections on addressing common challenges with locally appropriate strategies, identifying mitigation options, developing ecosystem-based mitigation agreements, and adopting performance measures. Using the guide, infrastructure improvements can be advanced in harmony with such conservation goals as restoring fragmented habitats and reducing wildlife mortality. FHWA has awarded 15 cooperative agreements to organizations in 10 States to field test the Eco- Logical approach. Projects include a streetscape improvement initiative in Chicago, Illinois, and the development of a regional conservation network in Western North Carolina, including protected conservation land, farmlands, and forests. Transportation research has produced many advances that have improved all aspects of the highway system, resulting in longer lasting pavements and bridges, smarter construction practices, more effective asset management systems, and enhanced highway infrastructure security. FHWA's infrastructure research initiatives, for example, have developed improved highway materials, including high-performance materials to increase durability, as well as tools to help agencies in specifying pavement and bridge materials that better meet performance requirements. Though often unseen by drivers, these advances are saving lives, time, and money today. Increasing demands and limited resources, as well as higher expectations by the public, mean that the continued development and deployment of technology innovations is key to meeting the transportation challenges ahead. FHWA research is supporting the development of a next generation highway infrastructure that will strive to meet such goals as bridges that last 100 years and pavements that can be driven on for 50 years. Current research is also developing inspection and evaluation tools and technologies, as well as innovative materials and methods to better protect highway bridges and tunnels from security threats, while maintaining the vital functions of the roadway system. Research into asset management techniques and practices, meanwhile, has the goal of more effectively managing highway infrastructure networks while maximizing the return on investment. Construction was nearly ready to begin on the new 12-lane Woodrow Wilson Bridge outside of Washington, DC, in 2000, but engineers were concerned about the depth of the scour that might form around the bridge piers. Scour, which is an erosion of stream bed material around bridge foundations, is the leading cause of bridge failures in the United States. The project team, including representatives from the Maryland State Highway Administration, FHWA, and several consultants, turned to FHWA's Hydraulics Laboratory for assistance in predicting the scour at the new bridge and also at selected piers on the existing bridge, which would remain in service for several years while work proceeded on the new structure. Researchers at the lab used a combination of advanced numerical and physical scale modeling to simulate the flow and sediment transport conditions at the bridge and the resulting scour at the piers. During the design process, numerous alternative pier designs were also studied. The Hydraulics Laboratory evaluated these alternative designs and provided immediate feedback on the scour depths to the bridge engineers. The scour evaluations were part of a process that led to substructure design changes that have made the new bridge safer and more cost effective. Another major benefit of the research is that engineers gained a greater understanding of how vessel impact-prevention structures, which are placed around the bridge's foundations to prevent ships and barges from colliding with bridge piers, affect the scouring process. Lab tests revealed that the concrete structures, known as dolphins, proposed for protecting the main river piers of the Woodrow Wilson Bridge from ship collisions would dramatically increase scour at the piers. This finding led to changing the design to use a fender ring protection system that extends all the way around the piers. The new design has saved millions of dollars and is expected to reduce the maximum scour by nearly half and provide better protection from vessels. Since 1987, FHWA's Long-Term Pavement Performance (LTPP) program has studied why some pavements perform better than others, with the goal of building and maintaining an improved, more cost-effective highway system. More than 2,400 asphalt and portland cement concrete (PCC) pavement test sections have been monitored across the United States and Canada. Data from 13 LTPP test sections that had been constructed as new asphalt concrete over a new lean concrete base are now being used by the Strategic Highway Research Program 2 (SHRP 2). As authorized under SAFETEA-LU, SHRP 2's goal is to develop recommended procedures, practices, and applications to advance the Nation's highway system in the key focus areas of safety, renewal, reliability, and capacity. SHRP 2 Project R21, "Composite Pavement Systems," is investigating the design and construction of new composite pavement systems, focusing on the use of an asphalt layer over a PCC layer and a PCC surface over a PCC layer. Data from the LTPP test sections are being used to develop, refine, and calibrate rutting and fatigue cracking models for composite pavements, providing valuable input to the design of composite pavements that would be both long-lasting and easily maintained. As metropolitan planning organizations (MPOs) and State departments of transportation make decisions about which projects to fund through their Transportation Improvement Programs (TIP) and Statewide Transportation Improvement Programs (STIP), prioritizing projects and streamlining the planning process is vital to accomplishing their transportation goals. Decisions on which projects to include are based on many factors, including future travel demand, project life-cycle costs, land use changes, economic growth, safety, and environmental impacts. Once projects are funded, tracking them as they move through the various stages toward the start of construction is also crucial. These stages include facility planning, engineering and design, right-of-way acquisition, advertising, bid review, construction scheduling, and related phases of work. FHWA's Transportation, Economic, and Land Use System (TELUS) software provides key support in helping agencies manage their TIPs and track projects, resulting in significant time and cost savings. TELUS allows users to track the project schedule, costs, and funding, as well as offering analysis tools to rate and prioritize projects. The fully customizable program is available in both a stand alone desktop version and a Web-based version. Two-hundred and twenty-four MPOs and 34 State departments of transportation are registered users of TELUS, as well as 36 other local and regional government agencies. More than 60 MPOs use TELUS for TIP development. The Web-based version of TELUS has been deployed by the Alabama Department of Transportation, as well as MPOs in Houston, Texas, New York, New York, and Dayton, Ohio. In Alabama, the transportation department is using a Statewide Web-based version of TELUS to link all of the State's TIPs into one database. The Web-based version also helps facilitate the public involvement process by enabling community members to obtain project information. The New York Metropolitan Transportation Council's (NYMTC) implementation of TELUS, meanwhile, has streamlined and improved information exchange and communication among different units of NYMTC and its member agencies. "It increased personnel efficiency and productivity, tremendously reduced the paperwork, reduced the erroneous data in the system, and expedited the approval process," says Larisa Morozovskaya, Senior Transportation Analyst with NYMTC. MPOs can realize significant cost savings by using TELUS. For example, an MPO with a TIP consisting of 450 projects can save an estimated $200,000 to $300,000 per year by using TELUS for TIP development, review, and approval. States can also benefit. A State department of transportation can save an estimated $30,000 to $55,000 a year by using TELUS to provide project-related information to its various offices, outside consultants, and others. The ability to view project information online, record comments, and ask questions can also save community members as much as $40,000 annually, as TELUS eliminates the need to travel to a local planning office or to public hearings. Freight movement by all modes of transportation has grown rapidly, spurred by a combination of globalization, changing logistical practices, population growth, and increased economic demand. The American Association of State Highway and Transportation Officials estimated in 2007 that U.S. container traffic increased from 8 million units in 1980 to 42 million units in 2005, and is expected to hit 110 million units by 2020. Along with the increases in freight volume, the average length of haul for trucks increased 80 percent between 1970 and 2000. FHWA supports research opportunities identified through the Freight Cooperative Research Program and is also assisting with regional operational needs, such as developing compatible traffic control technologies and procedures and identifying methods to expedite freight movement. With more than $200 billion worth of goods moving back and forth across the U.S., Mexican, and Canadian borders each year, along with the 200 million people that legally cross the borders, border wait times can have a tremendous impact on the U.S. economy. Using satellite technology, FHWA manages an effort to measure travel times in corridors with a significant amount of freight traffic and border crossing times at major U.S. land border crossings. FHWA is also developing new technologies to automatically measure travel time and border crossing times. Two test programs are being conducted at border crossings in Otay Mesa, California, and El Paso, Texas. By collecting this delay and travel time information, FHWA can help Federal and State agencies target transportation investments where the greatest needs exist, reducing congestion at border crossings and accelerating the movement of freight traffic. From super highways and multispan bridges to rural byways, FHWA's commitment to highway research has changed the way roads and bridges are designed, constructed, and maintained across the country. Looking to the future, new research initiatives are building on this legacy, taking the country in the direction of advanced technologies that will help redefine the 21st century transportation system. The 20-year Long-Term Bridge Performance Program, for example, is investigating how the United States can manage its bridges better and ensure their safety and durability. The program will inspect, evaluate, and periodically monitor a representative sample of bridges nationwide. The Exploratory Advanced Research Program, meanwhile, is focusing on longterm, high-risk research with a high payoff potential. Projects sponsored by the program include an initiative to improve the early detection of corrosion in bridges, ultimately increasing bridge safety and saving billions of dollars annually in maintenance, restoration, and replacement costs. FHWA is also researching the impact of extreme hazards, such as earthquakes, coastal floods, and hurricanes, on bridges and other highway structures, as well as the impact of global climate change. As has been accomplished in the past with such technologies as the ACS Lite software, these diverse research initiatives will continue the legacy of working with State and local agencies, industry representatives, universities, and other partners to achieve the breakthrough advances in transportation the country needs today. For millions of American drivers, FHWA's transportation research remains the ticket to a safer, less congested future that will continue to keep them moving.